Founder Dave Campbell has been practicing the entrepreneurial spirit from a young age when he recounts selling candy on the school bus to his sugar starved classmates. With his current bootstrapped startup, GivingSomeThing, Dave has been able to impact the lives of those of need by providing an online platform that puts donors and nonprofits in direct contact with each other. There is no transaction, processing, or subscription fee of any kind to either the donors or the nonprofits. Instead of simply donating money without knowing how it will be spent or to what need it may go to, GivingSomeThing is a startup that allows users to buy items and send them to non-profits specifically based on the needs of the non-profit as they’ve specified. Nonprofits have direct control of their “needs” list and can edit it at any time. Users of the GivingSomeThing platform simply choose from a wide variety of goods to buy and send to nonprofits including but not limited to school supplies, art supplies, electronic items, books, and cleaning supplies. In addition to running GivingSomeThing, Dave and his team recently completed a 7 week “Voluntour” in which they travelled the country getting involved in volunteering, meeting nonprofit heads in person, and meeting new people in order to share the mission of their personal and business vision with local communities. I read that your entrepreneurship experience began quite young. What do you think all of your projects have had in common? The common theme is a focus on the mission, the product, and the experience. To run a business you need to make money, however, for me, I prioritize quality product, passion, and cumulative learning. A focusing on these qualities helps both the present venture, anything that I take on down the road, and, if done right, naturally lead to profitability and sustainability. Starting out with GivingSomeThing, what were the challenges that you hadn’t anticipated when you first had the idea for the startup and how did you address those challenges? For the business, the most challenging part is that we have two customers to serve and activate: nonprofits and donors. As a result, we are in a unique position to learn a lot because we have a big group of nonprofit partners and a big group of donors. Our challenge is to effectively disseminate knowledge to both groups and motivate them to take action in certain ways. We have found that utilizing case studies, best practice materials, and personal conversations have helped overcome these challenges. Personally, time management is really important. Startups are inherently a labor of love and, technically, you never stop working. You work all day, step out of the office, and it is still on your mind, fall asleep, and dream about it. It is important to give yourself a break every once in a while – be it a good meal, a workout, time with friends – and remember that everything needs balance. In fact, that balance makes your time at work more effective and efficient. What advice do you find yourself usually giving to others interested in launching a startup? Think it through. Mike and I were very deliberate about our research and business plan process. We took a lot of time to analyze the industry, competitive landscape, financial model, feasibility, and execution of GivingSomeThing. Entrepreneurs have business ideas every day; the question is, which can be launched and run successfully. To create a business plan helps assess that question and decide if it makes sense to move forward. Share the idea. One big fear we overcame was sharing the concept. Initially, there is the thought that someone you talk with is going to take your idea and steal it out from under you over night. The odds of that happening are incredibly slim because of your passion and motives for starting the business, and the fact that everyone else is pursuing their own careers, startups, or businesses. By sharing the idea you will get some great feedback, advice, confirmation of concept, and invaluable criticism. Why did you feel there was a need for a business like GivingSomeThing? People love connectedness. 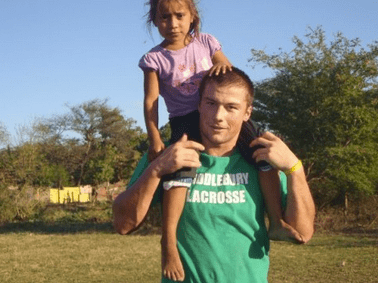 From my work on the Board of Directors with Lacrosse the Nations, I learned that the online giving community was asking for a way to do more and to feel better connected to that giving. We needed goods for lacrosse the nations and the process was bulky, inefficient, and cumbersome and that an online platform would be helpful. With that seed, Mike and I assessed the marketplace, further developed the concept, and launched GivingSomeThing. We’re happy to make online giving tangible and transparent while improving the connectedness between donors, nonprofits, and the people that they serve. Can you tell me about your daily routine from the moment you wake up? First things first, we make a fresh pot of coffee. I have plenty of energy as it is, but Mike and I share an affinity for a morning cup (or two) of coffee. From there, I like to get on top of emails and customer service inquiries, followed by social media updates. After that, we look to take on prioritized tasks. Running a startup means you wear a lot of hats and have a never ending “to do” list. It is important to assess that “to do” list, prioritize tasks, and get things done. The balance comes from having the flexibility to take on the unexpected or urgent needs while moving forward with the rest of the tasks. It’s important to step away for meals (which can be hard at times), as well as a workout. One thing my routine does not include is TV, there’s too much other fun stuff to do. Do you have a particular business philosophy or vision that you can tell our readers about? To give is to receive. Generosity feels goods and it’s a wonderful thing to see how you can help, encourage, support, and uplift people. I believe in giving and giving freely without expectation or requisite reciprocation. Every day you can give to the people around you in many ways: time, energy, effort, optimism, humor, money, skills, advice. That being said, it will come back in untold ways… including the simple smile of knowing that you’ve done some good in the world. In addition to this sentiment, we like the idea that by using GivingSomeThing, donors can give and nonprofits receive goods. Can you tell me about the company culture at GivingSomeThing? I’d say it is both deliberate and relaxed. Mike and I have been friends since we attended Middlebury College together, which makes for a relaxed, fun, and personal company culture. That being said, we both take GivingSomeThing very seriously and move the company forward in a deliberate, effective, and strategic way. Tell me about The Voluntour: how you came up with the idea and who is with you? The GivingSomeThing Voluntour was a dream come true. As Mike and I looked at our map of nonprofit partners, we realized that the vast majority were Boston-centric, which had a lot to do with our personal contact with local organizations. 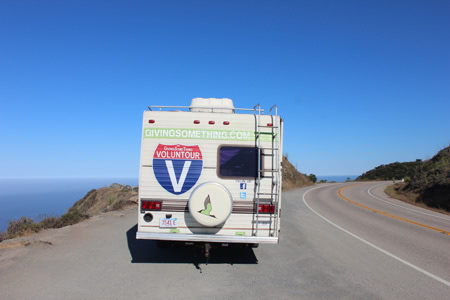 With a desire to spread the word about GivingSomeThing to every corner of the country and learn about various organizations’ work, we dreamt up the idea of a volunteering, RV roadtrip. 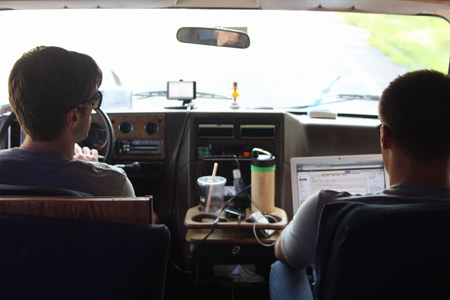 With some more thought, planning, and the purchase of a 1987 Chevy Mallard (thank you, Craigslist), we hit the road. For 7-weeks Mike and I toured the country and we’re lucky enough to be joined by friends and family along the way. What’s been the most rewarding part of the tour thus far? Getting to work shoulder-to-shoulder with both the organizations we support and the people they serve. It easy to get in the routine of emails, phone calls, meetings, and networking events, which all help us support nonprofits and donors in a unique way. However, it was a rewarding to learn first hand about the programs that exist around the United States, meet the people that run them, see their work, offer a helping hand, and better understand their needs. What’s been the most difficult aspect that you didn’t anticipate when planning and setting out? The timing. We covered a lot of ground (over 8,000 miles) and had a very full schedule with few rest days. As a result, we did some long and late drives, put out constant energy, and had to get creative about continuing to run GivingSomeThing and make sure we were on top of blogging and follow up from The Voluntour. Also, the Mallard didn’t have AC, making for some pretty warm travel days, especially in West Texas and Arizona where the thermometer teased 115F. We managed with open windows and lots of water, but I definitely appreciate returning to a quiet, temperature-controlled ride. How did you choose the projects for the tour? We worked with pre-existing nonprofit partners, connections through recommendations or our network, or by researching and calling on key groups in each city. We prioritized working with a variety of programs and, in doing so, worked with organizations focused on children, education, veterans, homelessness, athletics, disabilities, environment, and animals. 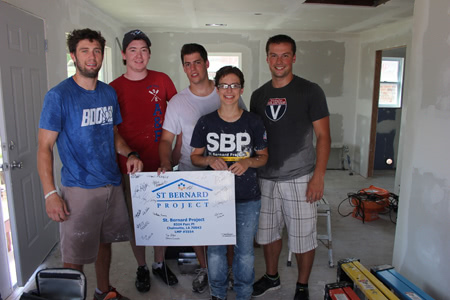 How did you fund GivingSomeThing and how are you funding The Voluntour? GivingSomeThing is currently bootstrapped and supplemented through our revenue model. All of the goods on our nonprofit Needs Lists are products sold and fulfilled by Amazon. While gaining the benefit of their efficiency and product variety, we also earn a percentage of the sale from their profits. This lets us provide GivingSomeThing’s service at no additional cost to donors or nonprofits (ie no membership fees, markups, or transaction costs). 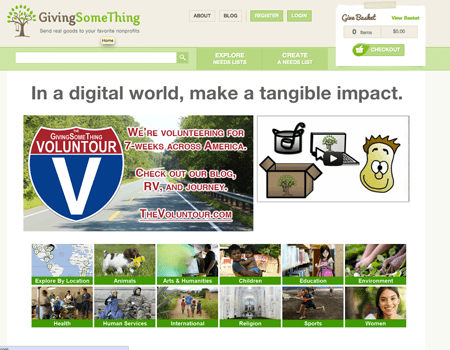 The GivingSomeThing Voluntour was generously supported through an IndieGoGo campaign and t-shirt sales. We were also incredibly lucky to be hosted at the homes of friends, family, friends of friends, and even a people we met along the way. How are you guys unwinding from The Voluntour? One of the first things we did was go surfing followed by cooking a meal. Surfing is always calming, cleansing, and refreshing and we were lucky to find a few nice waves. And, while we enjoyed some great meals on the road, it was nice to have a BBQ with some fresh veggies.